So I’ve seemingly tripped at the entrance of 2017 and fallen clean past the “healthy eating of the New Year” phase, straight down to the foot of Super Bowl snack-time. Oh nooooo… ? Ah, I can’t even pretend to be bummed about it. We’re watching the Super Bowl at our place this year, which means menu experimentation is starting early. The stakes are high. I’ve got a serious snack reputation to uphold, and everyone knows that the best part of the Super Bowl is the food. And the beer. Can’t forget the commercials. Oh and I guess there’s also the actual game. I kid. I actually really enjoy watching football! I’m looking forward to the Super Bowl, though my team’s already out of the running this year… which is par for the course. But if your team is still in this thing, then may the odds be ever in your favor. And if you and I are in the same, sad camp, not to worry. 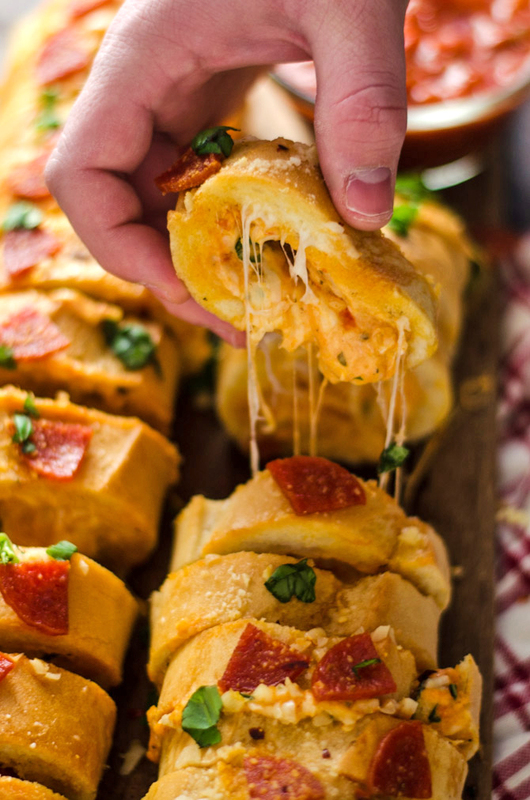 You can be your own champion this year when you make this Pepperoni Pizza Stuffed Garlic Bread. 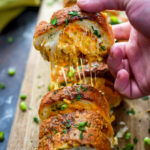 They say don’t mess with the classics, but I doubt they– whoever they are– have ever tried this: Buttery, garlicky, crusty bread stuffed with tomato-sauce spiked, pepperoni flecked, creamy, cheesy dip. 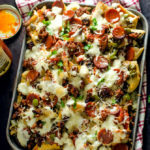 This recipe allows you to take all of your go-to guilty pleasures and combine them into a simple, shareable appetizer. One that even the pickiest of football fans will fall in love with, at that! 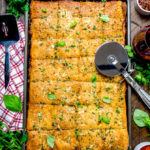 You might remember my Spinach & Artichoke Dip Stuffed Garlic Bread from last year. Perhaps you saw it here, or maybe you saw the adaptations that have made their way around the web. (There have been many, but mine is the original ). 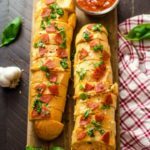 This Pepperoni Pizza Stuffed Garlic Bread is made with pretty much the same technique, but it’s even easier because there’s no need to cook the filling ahead of time. Just mix it all together and stuff it into the hollowed out Italian loaf. 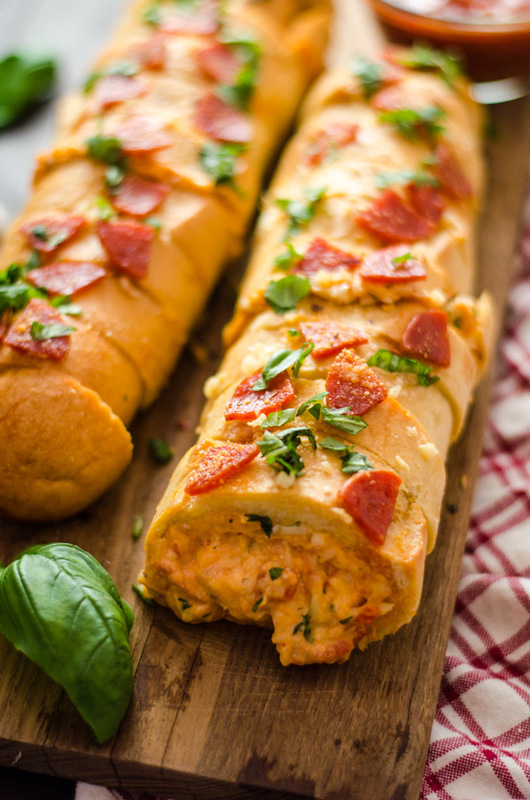 At that point you can top it with some torn basil and crushed red pepper, or you can wrap it all back up in foil and refrigerate it to reheat and serve later. It’s very forgiving of being heated through twice, which just makes it all the more of a must-make for when you’re throwing a party and have tons to prepare, or have to travel with a potluck dish. Whether you make it to serve at home or at a friend’s, don’t forget to take a picture and tag #hostthetoast on Instagram before everyone houses it! 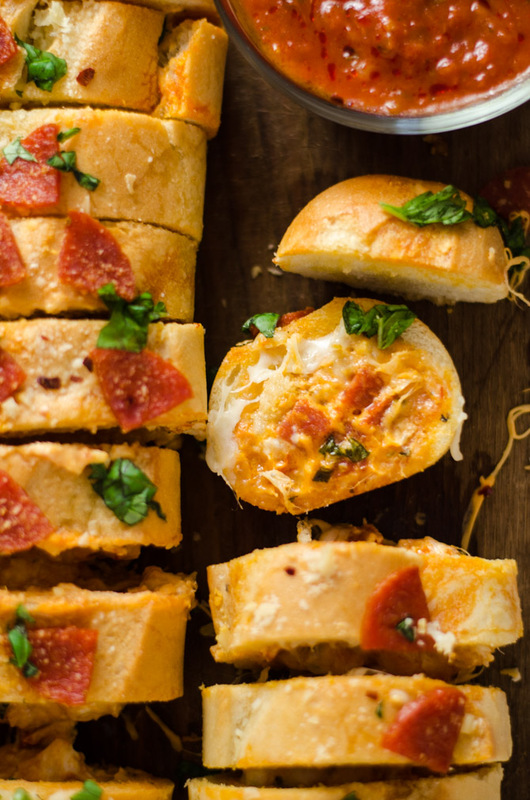 This Pepperoni Pizza Stuffed Garlic Bread is the kind of drool-inducing appetizer you’ve just got to document. Cut the loaf into 4 equal-sized pieces. Use a long knife to remove the insides, keeping some bread along the edges. Pull out the loose bread to leave hollow bread quarters. Set aside. 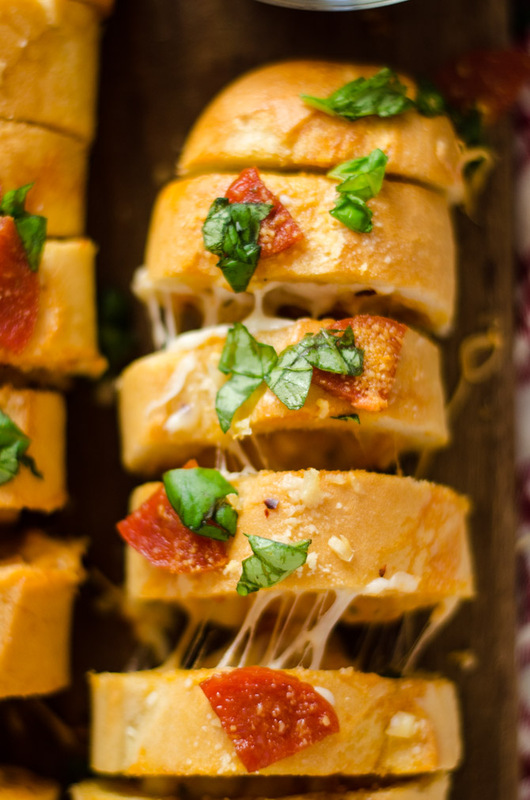 In a large bowl, mix together the cream cheese, mozzarella cheese, pizza sauce, parmesan, basil, dried oregano, and 1 cup of the chopped pepperoni. Mix well to combine. 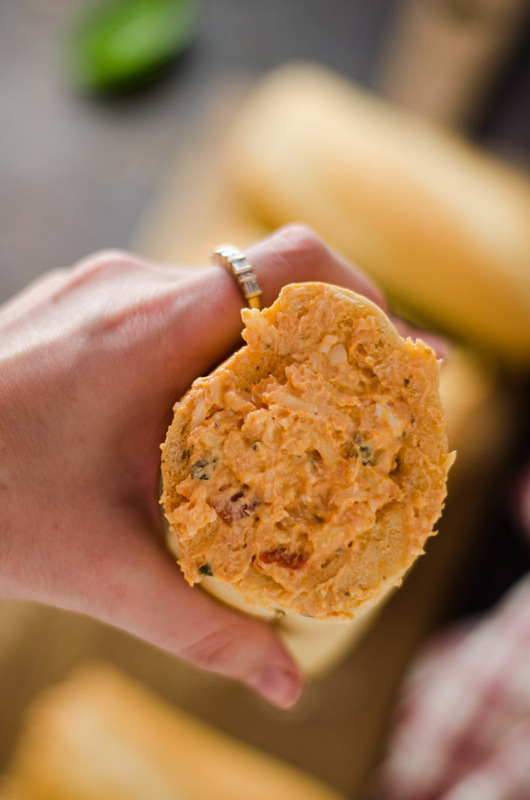 Stuff the baguette quarters with the pizza dip mixture, using a spoon to help pack the dip in. Once the bread is stuffed, transfer it to a cutting board. Line up the quarters so that they fit together as they did before the loaf was cut. 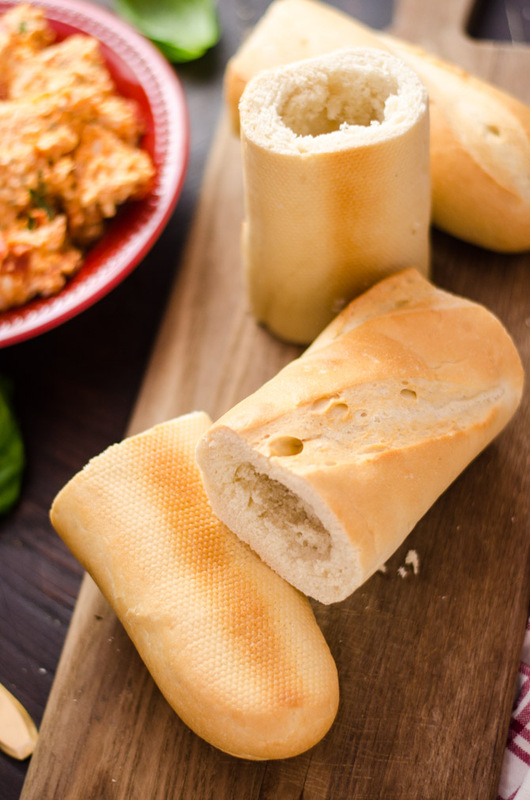 Slice the bread into pieces that are approximately 1″ thick. Tear a piece of heavy duty foil that is about 5-6 inches longer than the loaf. 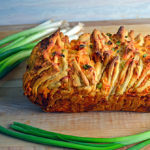 Slide the loaf slices off of the cutting board and onto the foil, keeping them together. In a small bowl, combine the butter and minced garlic. Loosely cover the top and microwave for a minute, or until the butter is fully melted. Brush the garlic butter over the baguette, allowing some to drip down between the slices. 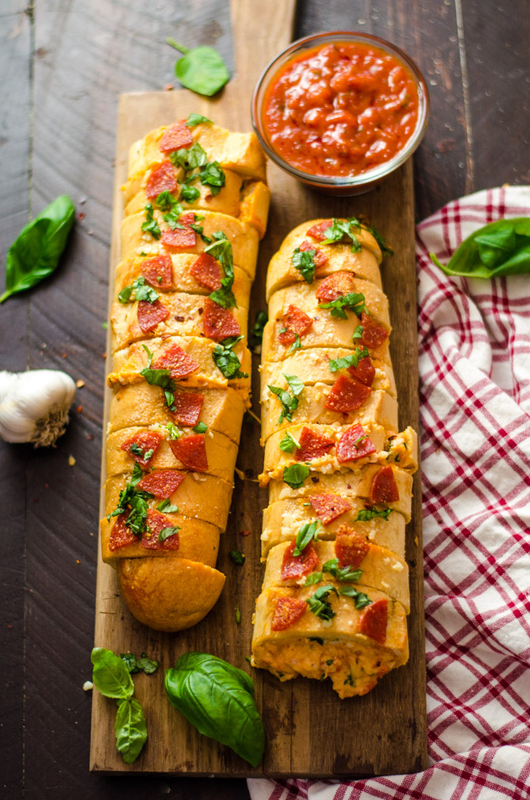 Make sure to get all of the minced garlic on top of the bread. 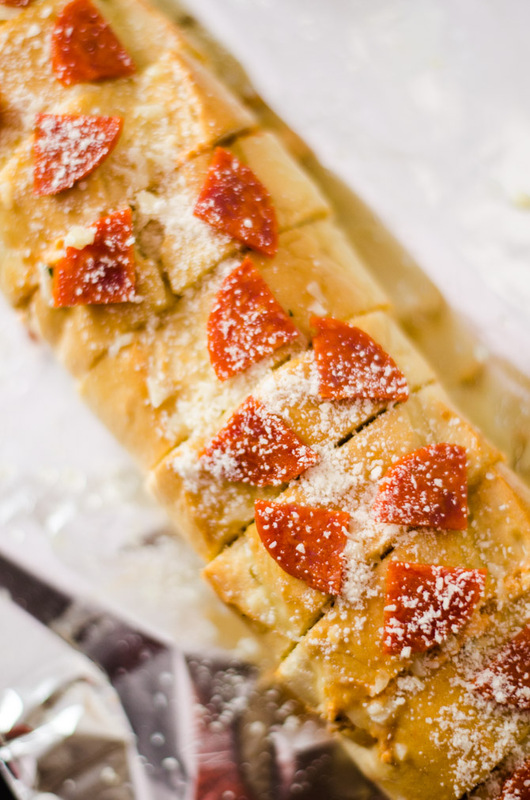 Top with the remaining pepperoni and sprinkle with additional parmesan cheese. Remove from the oven, sprinkle with crushed red pepper flakes and basil, and serve with pizza sauce for dipping. 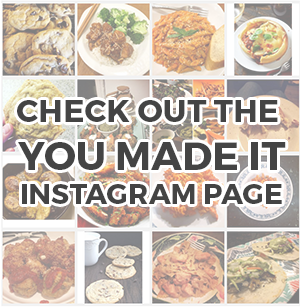 These recipes look to good to put out for the guest.